PechaKucha, Japanese for chit-chat, is a worldwide series of events, started by architects in Tokyo in 2003, that feature speakers presenting a talk and 20 slides for 20 seconds each—that’s six minutes and forty seconds. The goal of the event is the exchange of ideas, and the conciseness of the presentations encourages quickness and a concentration of many speakers and innovations into one night. 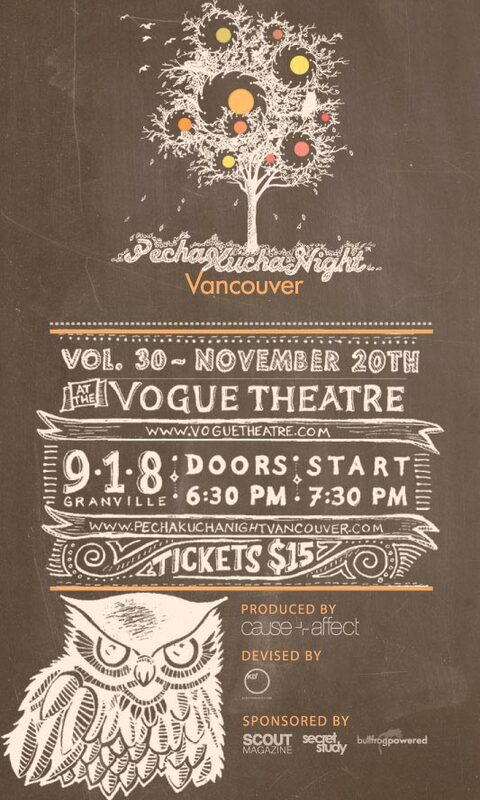 Sometimes they are themed, but PechaKucha Night Vancouver Volume 30, the last of the year on 20 November, brought a range of 11 speakers from art, academia, politics and business. As musical act Hannah Epperson, with her violin and looping machine, plaintively—and patiently—competed with the shouted conversations of the crowd, I was astounded by the sheer volume of the talking which only ceased when the girl spoke to briefly introduce her next songs. She is obviously vastly talented, producing singlehanded the sounds of a full string ensemble plus voice, and I was a little offended that the audience was missing it; but then I remembered that this was a design crowd—they were not there to hear music. But it still seemed kind of strange and rude. My initial get-a-load-of-this-guy reaction to Koko Monk chocolates founder Paul Dincer’s talk of post-modern and avant-garde chocolates was quelled once he really got going and started waxing academic about food in relation to literature. This man is a scholar, a philosopher, a chocolate-prophet, and he proved his theory when he described the watermelon and sea salt chocolate he created in reference to Hemingway’s Old Man and the Sea, and the entire audience was united in a sigh of “ahhh…”. Another reminder that there is in fact still good in the world. Regan is concerned about the politics of food, and through his position as Executive Director of Hastings Crossing BIA, which he started, he is working to embed food security policy into the bylaws and constitution of the city. The skeptic in me tried to see PechaKucha Night as one more way for a bunch of people to promote their own interests under the guise of “sharing ideas.” But, as I listened to these passionate people who are working hard in their respective fields, who understand that big changes start locally, I started to feel optimistic. The more the city can champion people like the above, the better things are going to get, and I went home that night feeling excited about what is possible, not impossible, in the world. This entry was posted in X and tagged Farmer's Apprentice, Hannah Epperson, HastingsCrossing, Jonathan Tippett, Koko Monk, LoHA, PechaKucha, vancouver. Bookmark the permalink.